If you feel a bit of deja vu when listening to Anubis Gate's fine new release 'The Detached,' it may be because you hear echoes of Queensyrche in their music. Jacob Hansen's voice and many of the compositions on this disc sound much like the early works of that great American prog metal band. But before you get dismissive thinking Anubis Gate may be only clones, you need to listen carefully to 'The Detached.' This album is loaded with impressive and expansive progressive power metal that will charm the most jaded of ears. On their fourth release 'The Detached,' Anubis Gate shows once again their creativity and poise offering an grand work of immense and satisfying progressive metal. Both compelling and convincing, the songs show the caliber of Anubis Gates skills and their continued presences as prog masters. Very recommended! 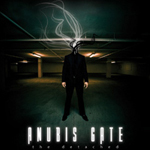 On their fourth release 'The Detached,' Anubis Gate shows once again their creativity and poise offering an grand work of immense and satisfying progressive metal. Both compelling and convincing, the songs show the caliber of Anubis Gates skills and their continued presences as prog masters.